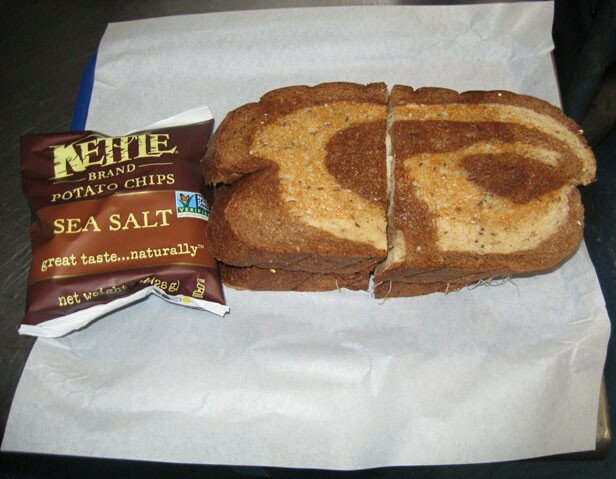 Your choice of bread - White, Wheat, or Marble Rye! «« »» Pick a potato chip - Regular, Jalapeno, BBQ or Salt & Vinegar! Thin slices of roast beef and roasted turkey are covered with melted smoked gouda cheese then topped with shredded lettuce and complimented with our honey based spicy Russian mustard. Two 4oz oven-baked chicken breasts are served topped with melted provolone cheese, tomatoes, shredded lettuce, and our house honey mustard. Thinly sliced turkey breast is layered with avocado slices, bacon, cream cheese, sprouts, mayo, and a hint of our house salsa. Thinly sliced turkey breast is layered with cheddar cheese, tomato slices, sprouts, and our house honey mustard. A classic sandwich which combines thin sliced ham and turkey breast, sliced tomatoes, shredded lettuce, bacon, Swiss cheese, and mayo. Imported Brie cheese is melted over the top of thinly sliced roast beef and served with tomatoes, sprouts, and our honey based spicy Russian mustard. Two 4oz. oven baked chicken breasts are topped with avocado slices, bacon, sprouts, and our honey based spicy Russian mustard. Thinly sliced roast beef is combined with green peppers, onions, spices, and topped with melted Swiss cheese and a spread of mayo. 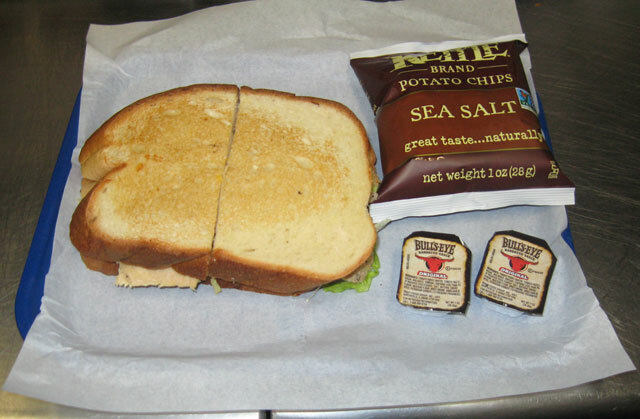 Thinly sliced roasted turkey is combined with sliced tomatoes, shredded lettuce, and our house honey mustard. Thin sliced Italian ham, salami, and pepperoni is topped with melted provolone and cheddar cheese and a blend of finely sliced onions, green peppers and peperoncinis, and then layered into a 10” artisan French baguette with shredded lettuce, tomatoes, mayo, yellow mustard, and a splash of Herb and Italian dressing. Lots of bacon, sliced tomatoes, and shredded lettuce are combined with shredded cheese, mayo, a hint of red onion, and a dash of black pepper. Thinly sliced roasted turkey is covered with bacon, tomatoes, shredded lettuce, cheddar cheese, and parmesan peppercorn dressing. Thin sliced turkey breast, avocado slices, cream cheese, sprouts, and mayo are combined together on a toasted croissant. Roast beef is covered with melted slices of cheddar cheese and complimented with yellow mustard. 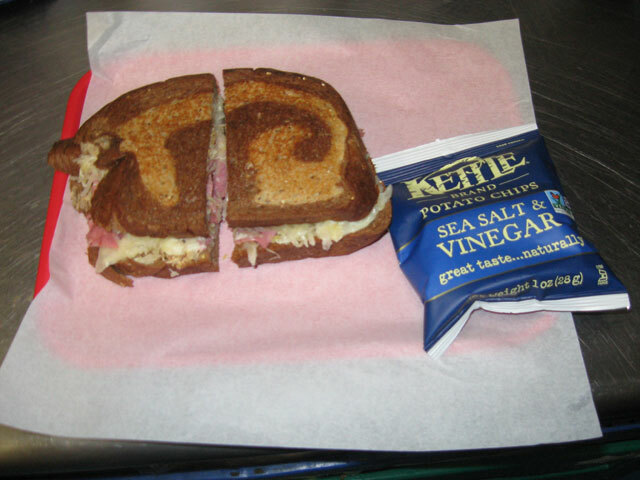 Thinly sliced lean corned beef is topped with sauerkraut and melted Swiss cheese and paired with our house chipotle whole grain mustard. Served on bakery fresh MARBLE RYE BREAD. Shredded lettuce, sliced tomatoes, onions, green peppers, artichoke hearts, black olives, avocado slices, sprouts, cheddar, provolone, cream cheese, plus a spread of mayo. 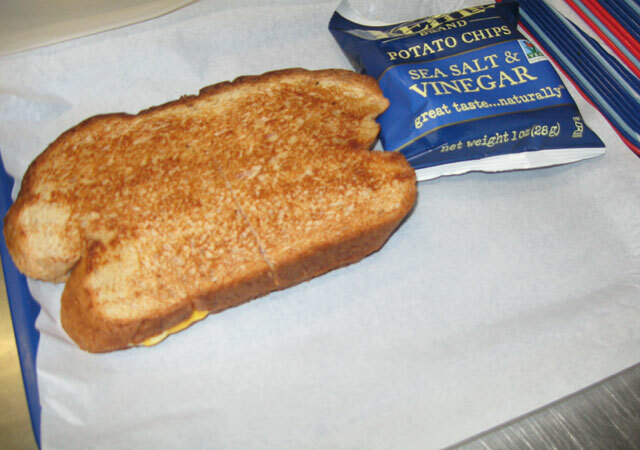 A classic grilled cheese with lots of melted cheddar and provolone cheese and served on your choice of thin sliced grilled bread. Your choice of creamy or crunchy peanut butter and grape or strawberry jelly. Request thin sliced bread if desired! 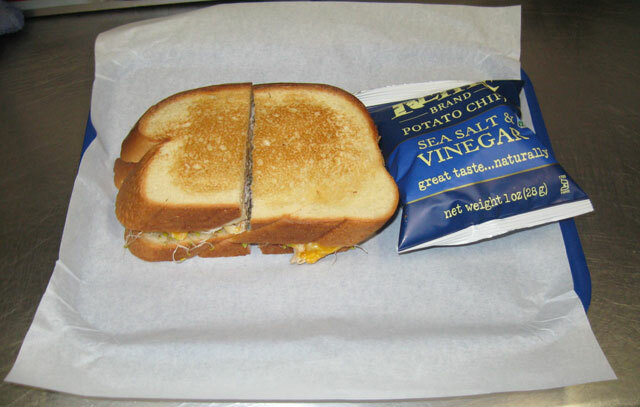 Enjoy any half sandwich and a bag of your choice of flavored potato chips. Pick any one of the soups* above and combine it with half** of any of our fresh deli sandwiches**. Includes your choice of potato chips. *You may substitute a Side Salad for a soup! **You may substitute a Side Salad for a sandwich!